During my restaurant research one name came up time and time again as being the very best restaurant in Vienna. 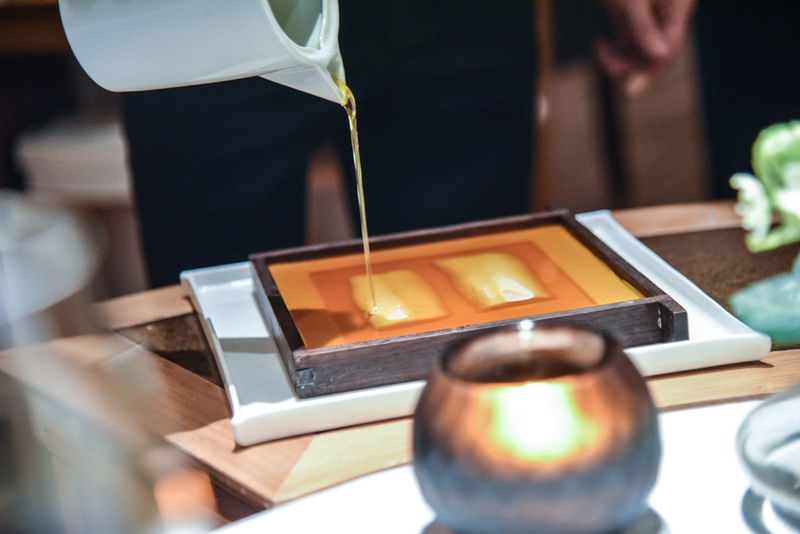 Ranked number nine in The World’s 50 Best Restaurant List, two Michelin star Steirereck was not only the best in the country but one of the best in the world. Arriving at the restarant’s location in Stadtpark, Theresa and I eagerly anticipated the promised gastronomic explosion. 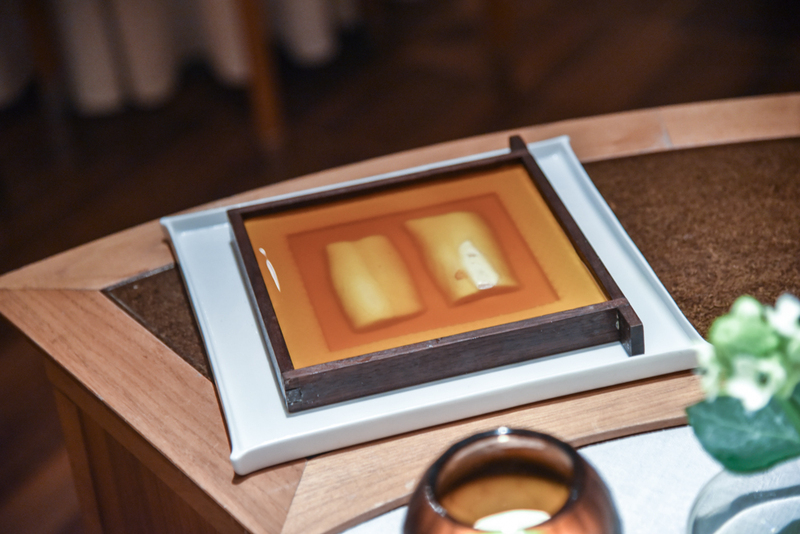 Shunning white table clothes and the other fripperies of fine dining, the restaurant is located in a glass cube in the middle of the park and the decor is minimalistic but still beautiful and elegant. Immediately were we offered our drink of choice from the champagne and aperitif trolley and we opted for a local Austrian sparkling wine. We really enjoyed the local wine in Austria which was as rule very dry and drinkable. Later when we wanted a still wine we were presented with two thick books, one of white and one of red! 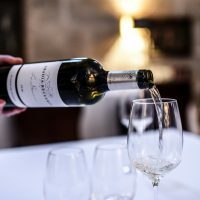 There’s the choice of going full on tasting menu, à la carte or mixing and matching between the two, seeing plenty that we liked we chose the latter option. 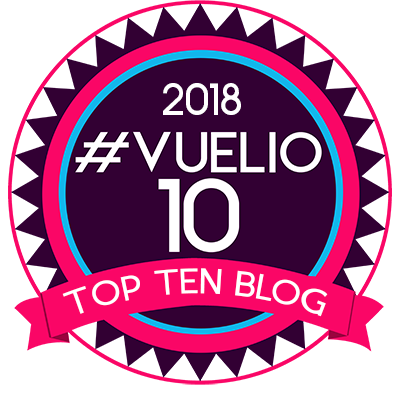 Soon our waiter began laying up the table with multiple canapés and amuse bouches…honestly I’d never seen so many…an array of nibbles which pretty much took up the whole table. Next came THE ACTUAL BEST THING EVER!! 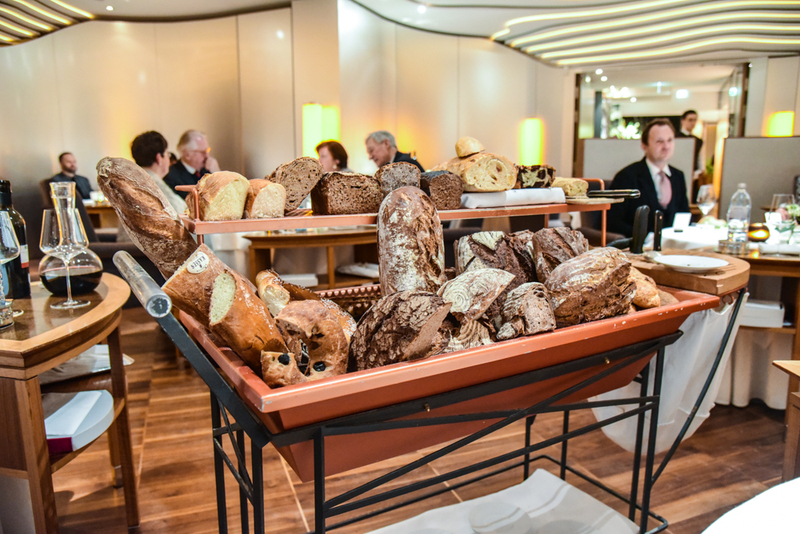 Regular readers will know how much I love bread and I think my heart almost stopped when a bread trolley was wheeled to our table containing around thirty different varieties of bread! The waiter went through each of them, explaining but we were spoilt for choice. I ended up choosing a chorizo bread and trying a pretzel bread with Theresa having one filled with bacon. Years ago we used to go for family meals at The Dorchester Grill and my favourite thing about dinner there was the bread trolley. It’s now long gone but my dad doesn’t fail to bring it up every time we go. It was actually the first time I’d seen a bread trolley and one with so much variety since then. 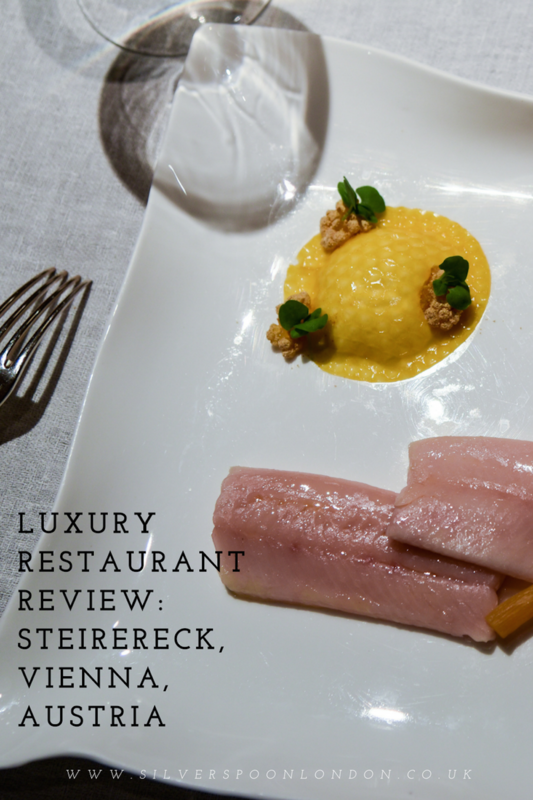 For my starter I chose one of the signature dishes at Steirereck and two pieces of char were presented to the table. 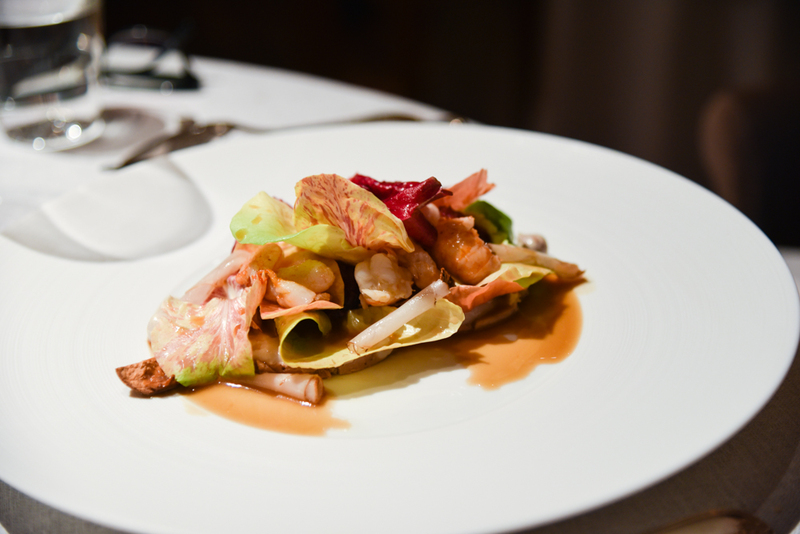 Sourcing is incredibly important at Steirereck and Chef Heinz Reitbauer sources many of his ingredients in Austria. 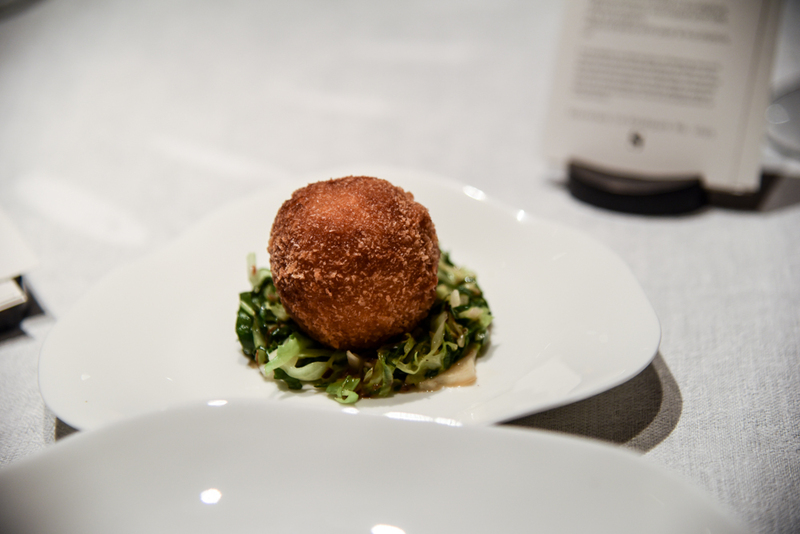 The fish comes from Mariazell in Styria which is also the city of the Reitbauer’s heritage and an important inspiration for his cuisine. 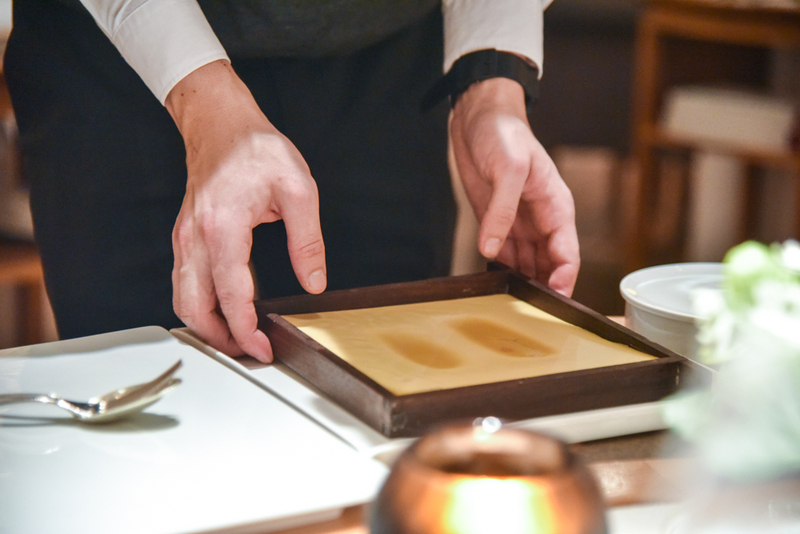 First the waiter pours beeswax over the char to cook it. 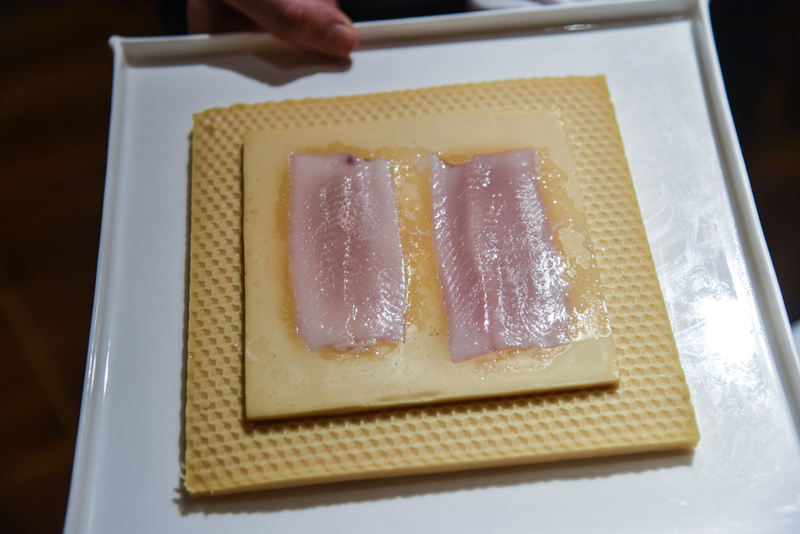 He then peels off the wax and returns the fillets to the kitchen. Before bringing back the beautifully presented dish including a delicate boiled and marinated yellow carrot. What looked like perfect rounds of ravioli were actually jellied yellow carrot and apple juice infused with beeswax and filled with sour cream with cayenne pepper and lime. On top was a cleverly made quince vinegar pollen made with char caviar. Theresa’s first course was crayfish grilled with a very inventive coffee butter, marinated foie gras, and jerusalem artichoke with bitter salad, crayfish marinade and coffee oil. 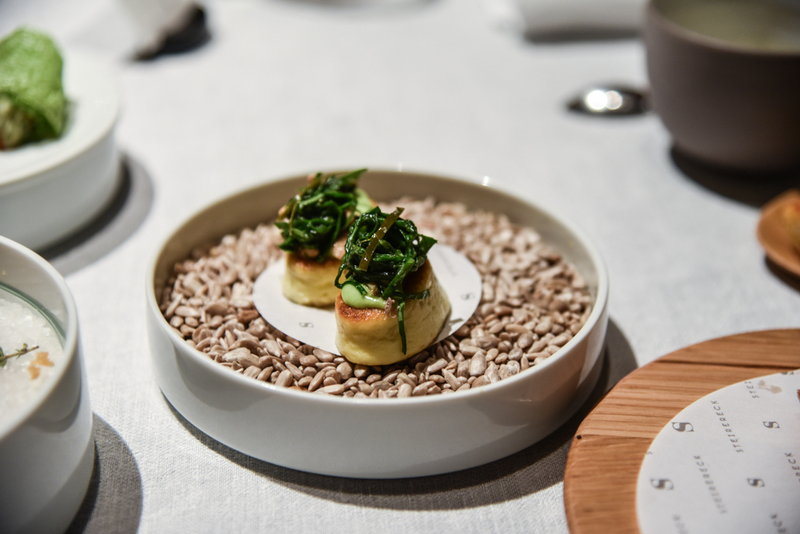 Texture and flavour is added with a crisped up peel of Jerusalem artichoke and preserved green hazelnuts. Over this a roasted crayfish and Jerusalem artichoke sauce is poured. 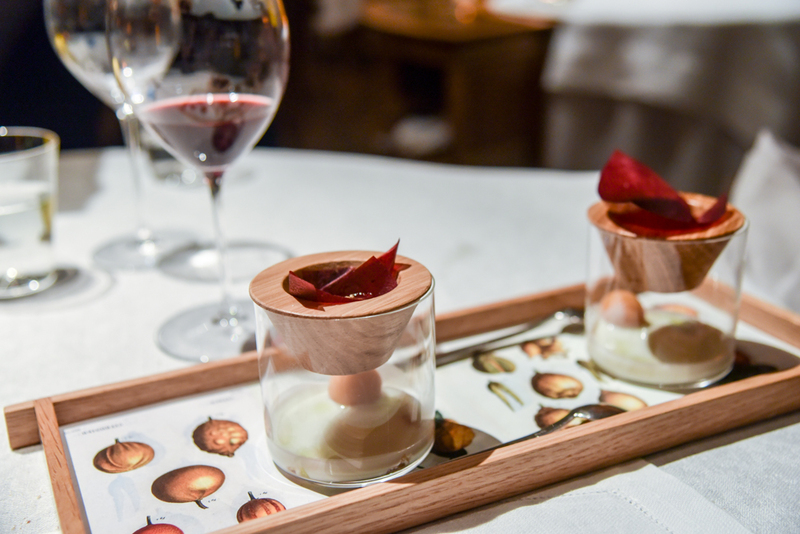 Perhaps Steirereck had a bloggers in mind as every course came with a little card explaining the dish that I could take away and keep, meaning no notes were needed and we could simply enjoy the meal and keep the cards as souvenirs. 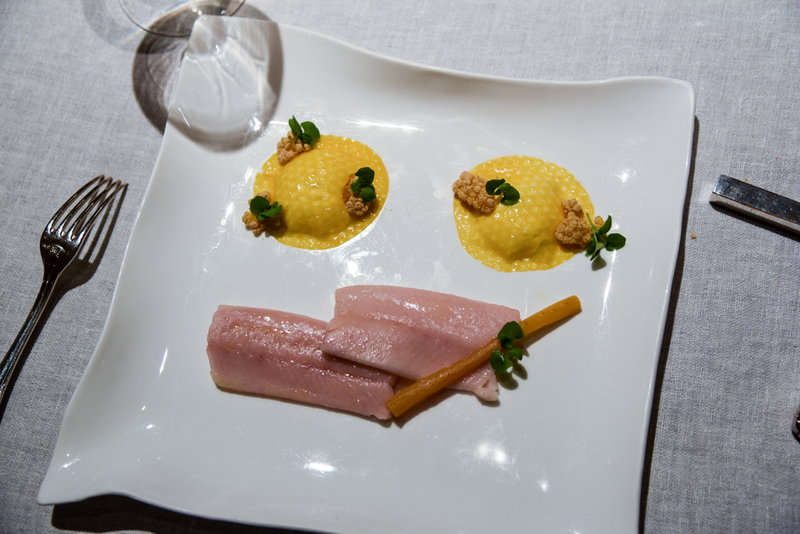 Though I’d never tried ‘Perlfisch’ before I chose it for my next course. It’s actually a ray-finned fish and a rare member of the carp family found only in Austria, Germany and Slovenia. 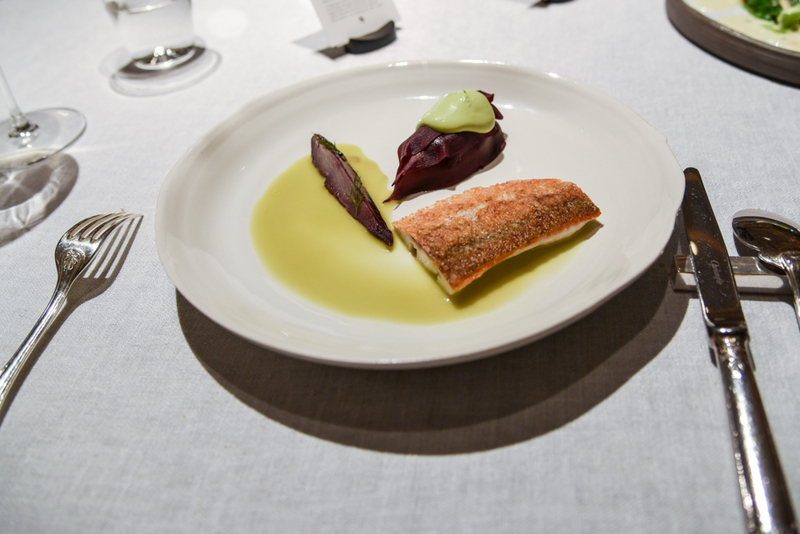 The fish was perfectly pan-fried and came accompanied with nasturtium root, elderberry and dill in various permutations. 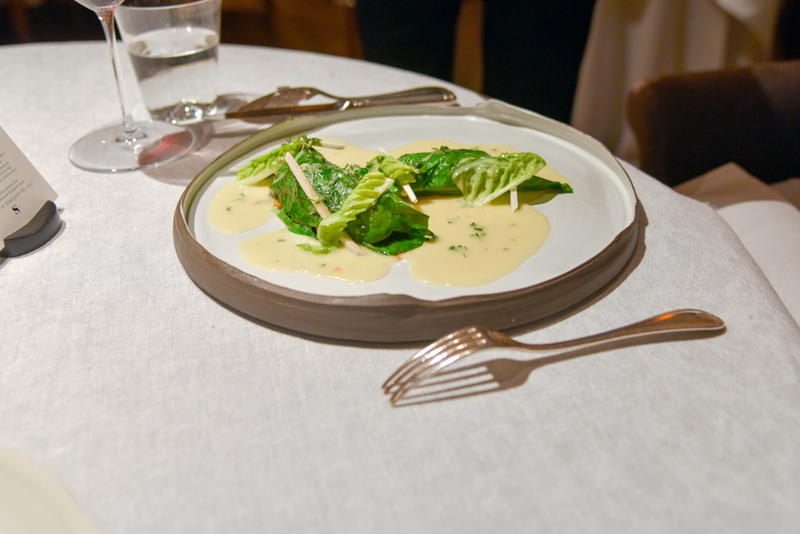 Theresa’s deceptively simple romaine lettuce dish came with meadow mushroom, meyer lemon and bone marrow and a touch of Viennese strugeon caviar was dotted on at the end. Produce here is only the very finest, coming from local farmers as well as the chef’s own farm. 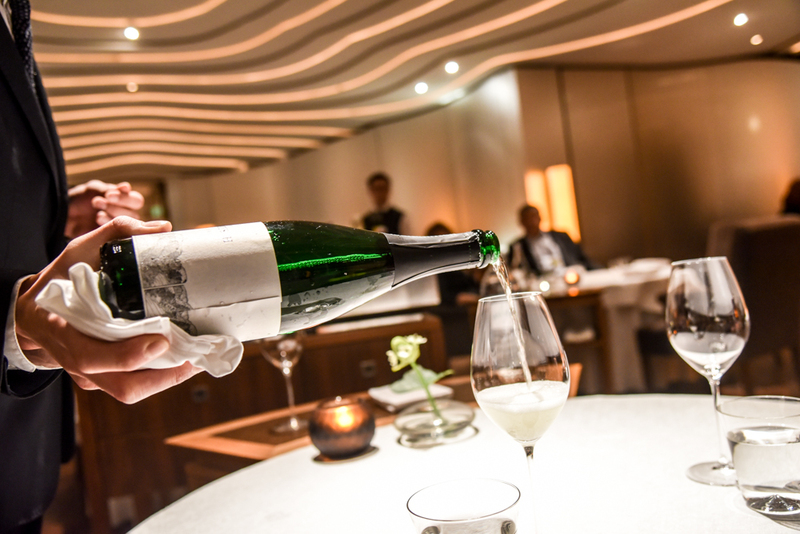 Steirereck has always been part of Chef Heinz Reitbauer’s life. 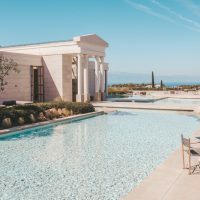 Founded by his parents in 1970 the same year that he was born, Heinz spent years working in the kitchen before being appointed Head Chef at his family’s second restaurant in Styria. It was in 2005 that Reitbauer moved the restaurant to its current location and became head chef of both restaurants. 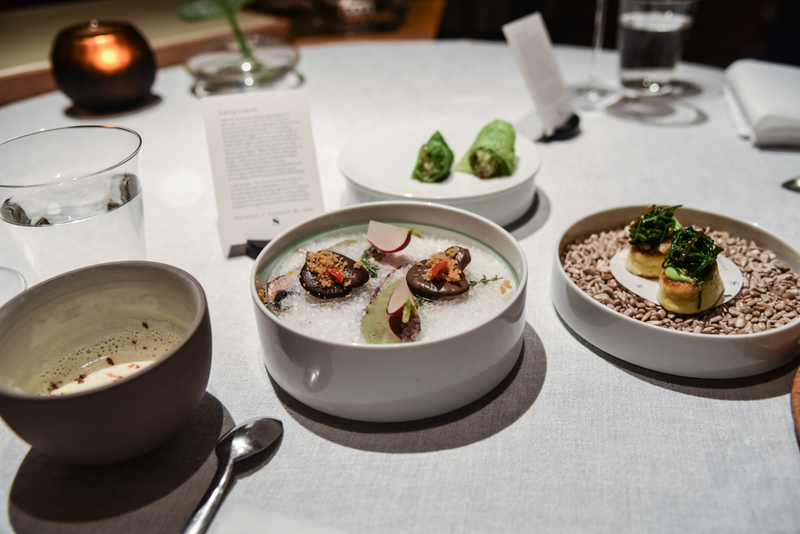 With the top restaurant in Vienna being in his blood, Reitbauer learned from the very best and created his own modern Austrian cuisine and is now one of the world’s best chefs. Next course was fish again for me and a sturgeon grilled, glazed and marinated in mustard oil and accompanied with Marchfield artichokes, cape gooseberries and olive oil. 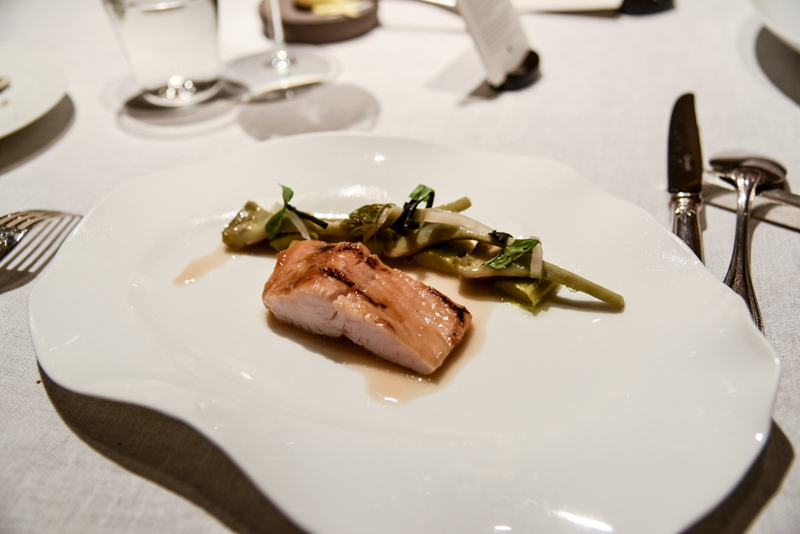 The sturgeon was firmer that the other fish with a strong flavour and I loved the artichokes braised with caper leaves. 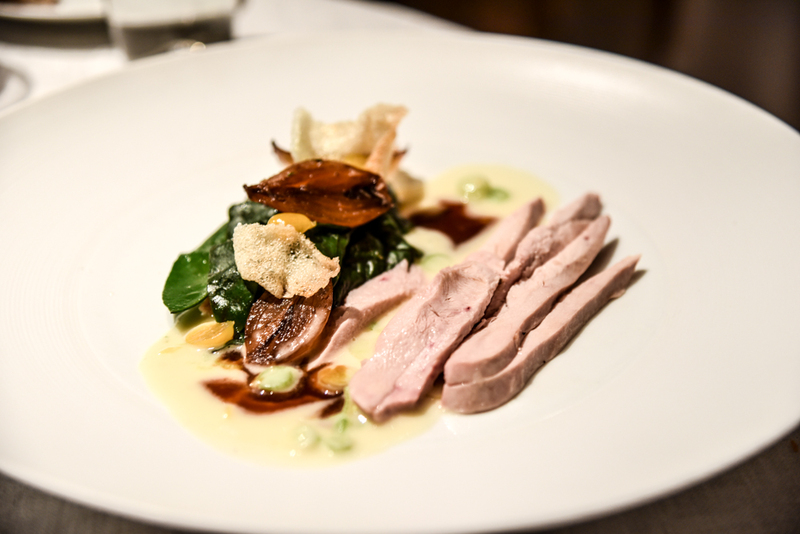 For Theresa, pheasant with salted lemon, braised onion, chard and groundcherry came next. 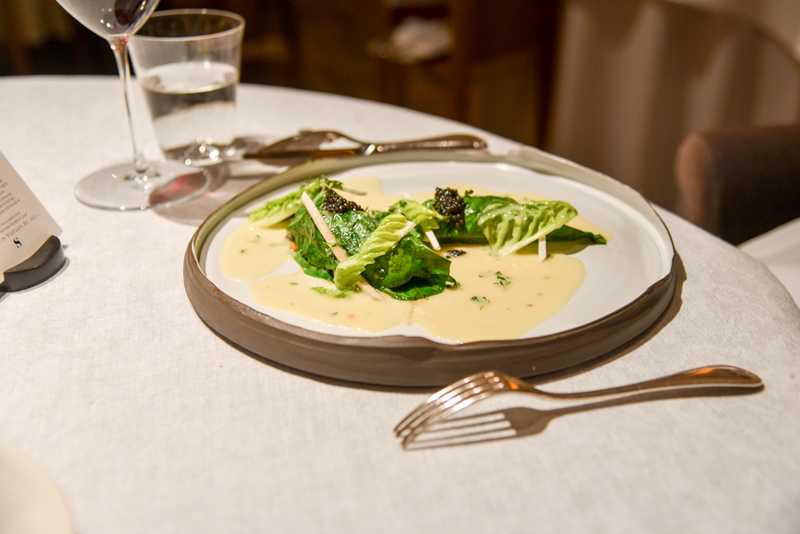 The confit breast was succulent and the leg was mixed with the chard for flavour. A delicate potato sauce was beautifully balanced with baby leeks and salted lemon. 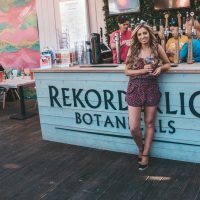 One of Reitbauer’s key manifestos is respect for ingredients and it’s important for him to surprise his guests with something different that they may not have heard of. In this case the groundcherry which is actually similar to a cherry tomato with a flavour combining pineapple and tomato. 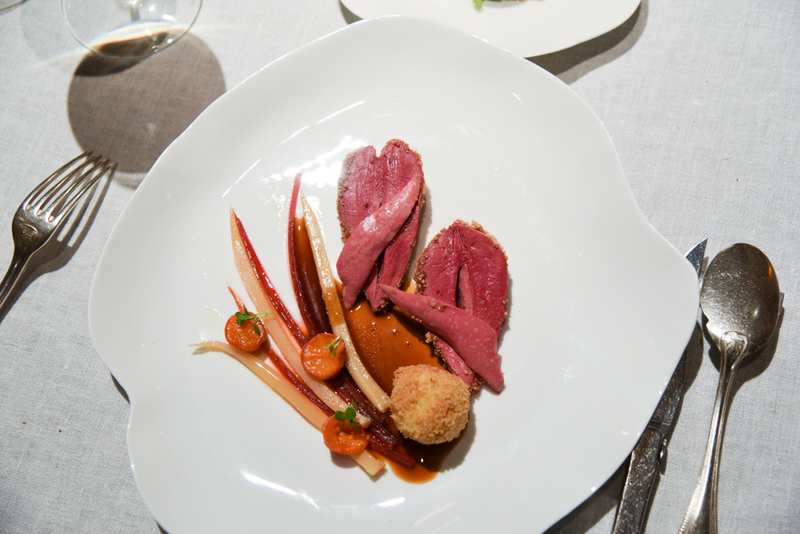 My favourite course was a whole roasted pigeon coated with cassava crumbs, accompaniments were pigeon crackling dumpling, parsnips cooked with apple juice, verjus and buchu (an African herb), steamed chard and lychee tomatoes. 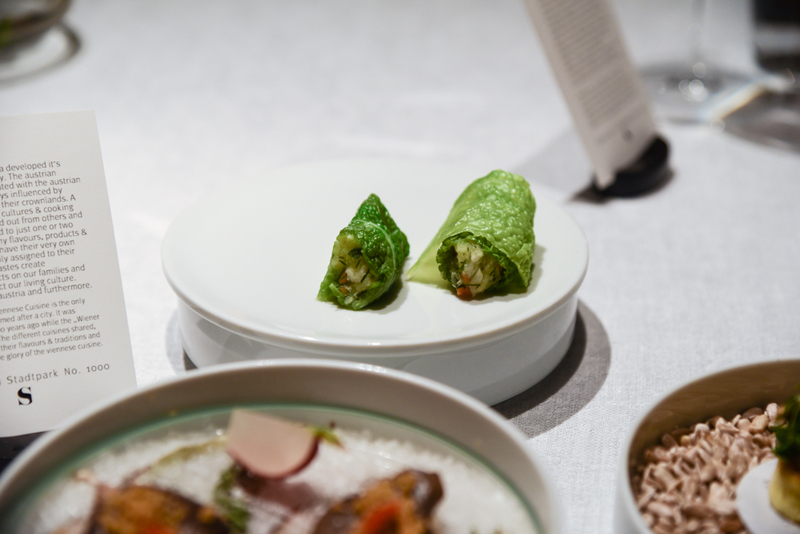 Separately on a bed of lightly fermented chard leaves was a rich pigeon offal and foie gras dumpling. You can see the obscure ingredients, the deep levels of research that goes into compiling these dishes. Theresa declared her final dish the best of the whole trip. 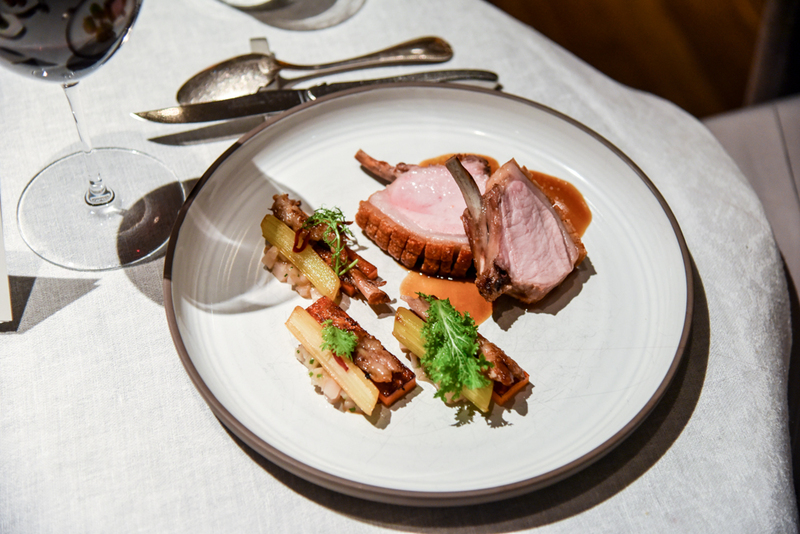 A milk-fed piglet accompanied by a celeriac pear salad and sweet potato braised in eucalyptus. The pork tail was also glazed with Eucalyptus and meyer lemon. 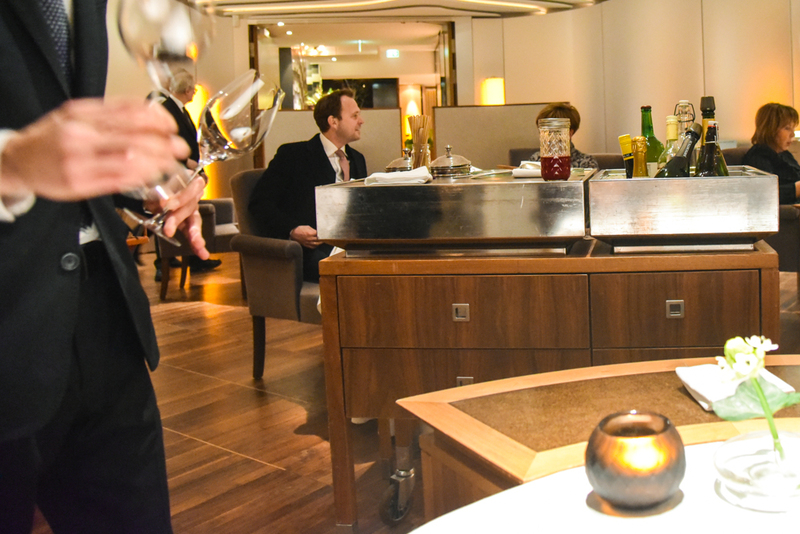 Next it was time for another of Steirereck’s legendary trollies…the hallowed cheese trolley. 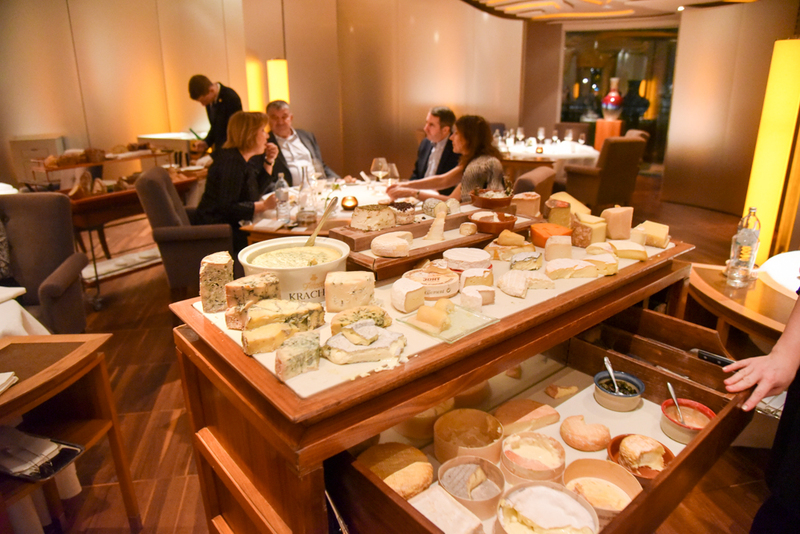 If you read my post about our dinner at Ocean in Jersey, you’ll know that Theresa basically lives for cheese and honestly I’ve never seen anyone so excited as she talked through her options with the ‘cheesemonger’. I’m sure that she won’t mind me telling you that despite our multi-course menu, she also went in for seconds. 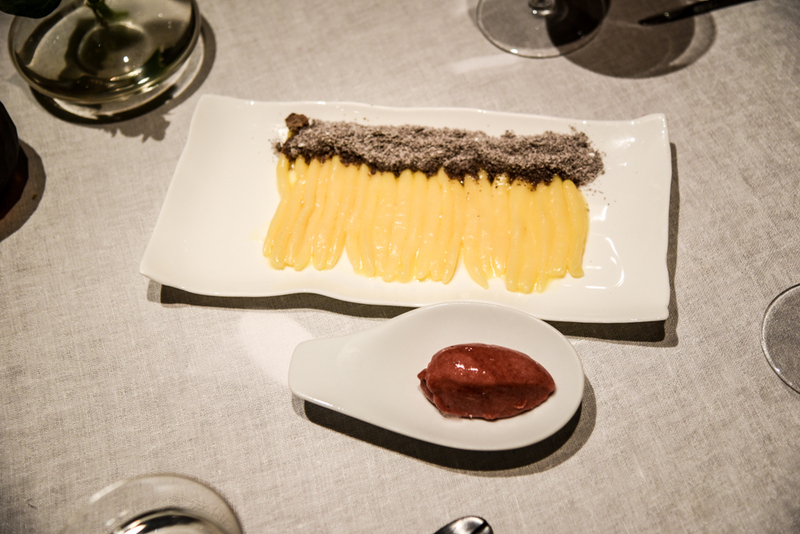 We also shared a dessert of poppy-seed noodles with damson ice cream which was inspired by a traditional Austrian dessert. The noodles were made from potato dough and glazed in poppy-seed butter. 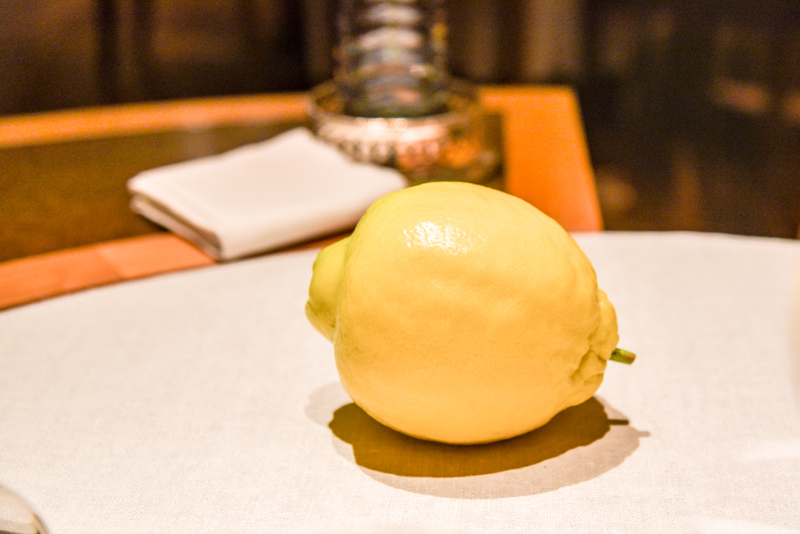 We were finally presented with the world’s largest lemon variety while the waiter concocted our final surprise. 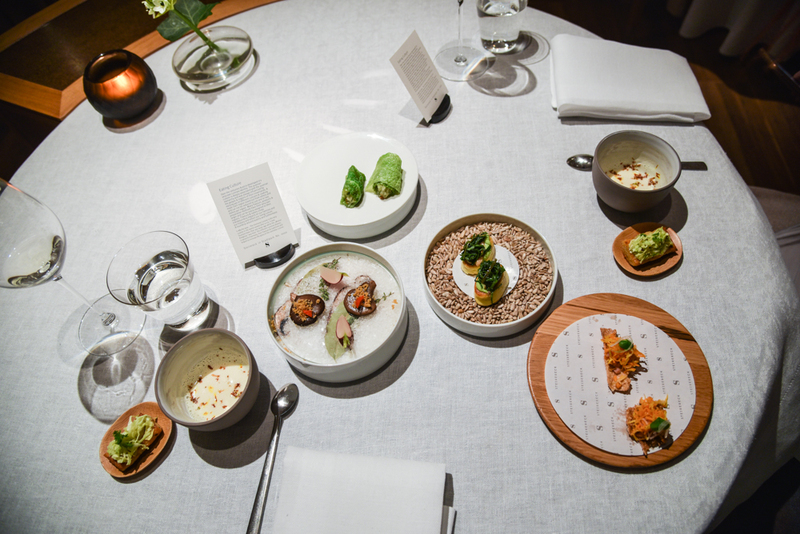 One thing I really loved about Steirereck was that there was absolutely no rush to complete our multi-course meal. We started at 8pm and didn’t roll out leave until 11.30, giving us plenty of time to fully enjoy the experience. We finished with a palate cleansing smoothie and a variety of citrus fruits from the Orangery of the Schönbrunn palace. 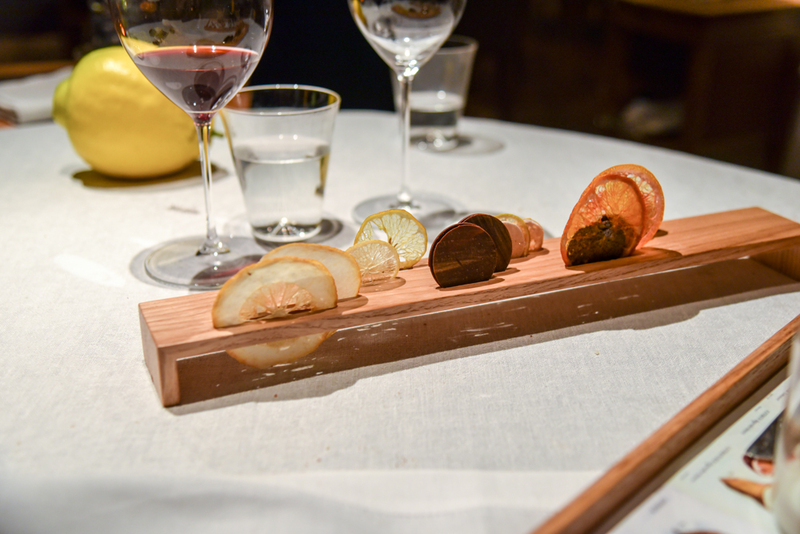 On the wooden board was white chocolate with pumpkinseed oil, Persian lime with black nattle, candied sweet lemon and candied diamante citron. 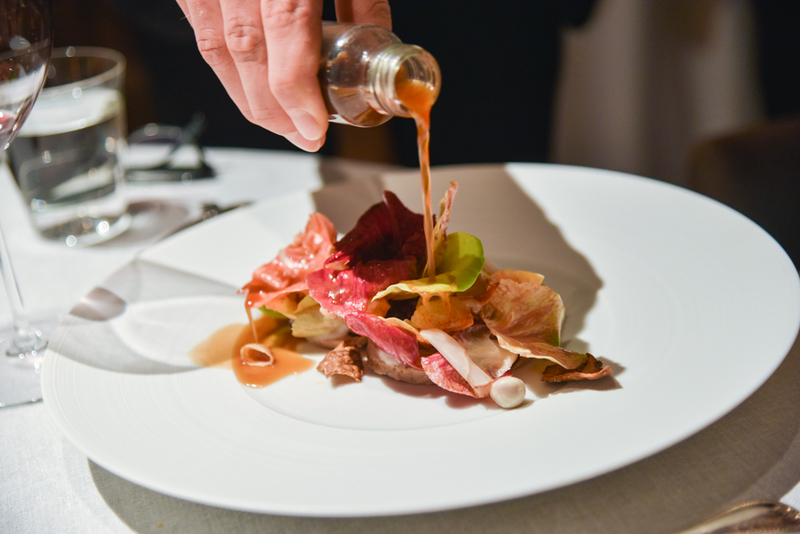 It’s safe to say that our dinner at Steirereck was one of the best meals of my life, on a par with The French Laundry, Alain Ducasse at The Dorchester and Enocteca Pinchiorri, Chef Heinz Reitbauer creates an unforgettable magic in the kitchen. 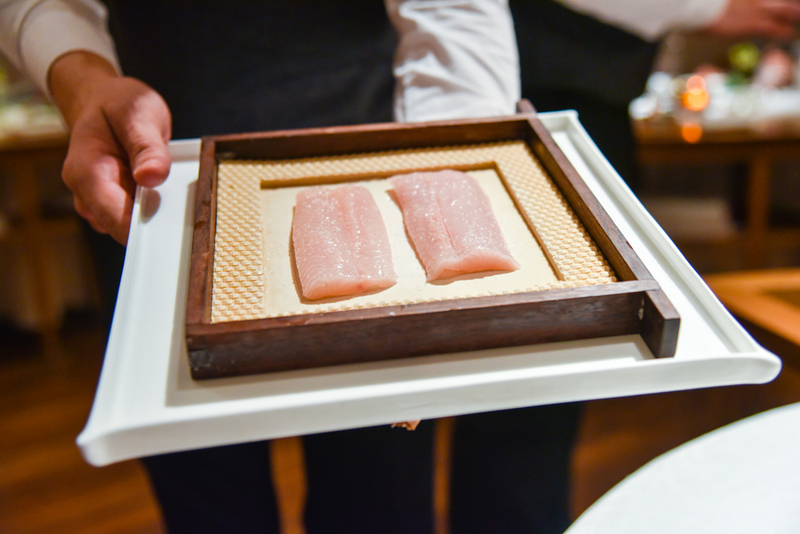 Of course, this level of quality comes at a price and it was also one of the most expensive meals of my life. Totally worth it though but if you’re looking not to dent your wallet so much, there’s also a lunch menu. 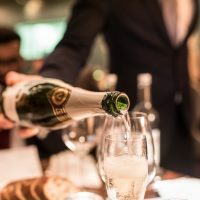 There’s also the option of trying Meierei, Reitbauer’s more casual restaurant in the same location which boasts a choice of 120 varieties of cheese!